Khan Yunis - Where is Khan Yunis Located? One of the Villages/Cities of Gaza District, find here important information and profiles from Khan Yunis. Where is Khan Yunis City Located? 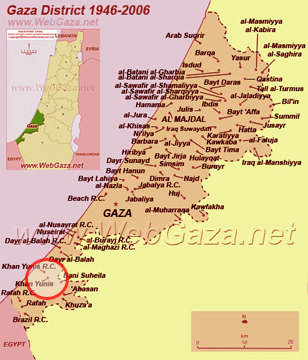 Khan Yunis is located in the southern part of Gaza District, north of Rafah, as shown on the map. Twenty five kilometers south of Gaza is the city of Khan Yunis, the second largest city in the Gaza Strip. Khan Yunis, and its neighboring camp to the west, have a total population of more than 124,000 inhabitants. The center of the city is about 4km from the sea shore.